****** FALL SPECIAL *****-- OCTOBER 2018 THROUGH DECEMBER 2018 25% OFF STANDARD RATES; GREAT DEALS FOR THANKSGIVING AND NEW YEAR'S. PLEASE CONTACT US ASAP. Aloha and welcome to your vacation paradise, and your Home in the Sun, Hale Akala BT 404, in the luxurious Ko Olina Beach Villas Resort, on the calm, leeward, west coast of Oahu. Relax and enjoy this ULTIMATE luxurious paradise -- you may find that you want to stay forever! Once a historic playground for Hawaiian royalty, the private gated Ko Olina Resort offers all you need to fulfill your needs for the day, a weeklong vacation, or however long your heart desires. The resort features four lagoons for swimming, snorkeling and sunbathing. Ko Olina is situated among all the Hawaiian Islands in that it offers an 'outer-island experience' with the convenience of being 30 minutes from the city energy of Honolulu & Waikiki. There's no other place like it! One of the most exclusive villas in the Ko Olina Beach Villas Resort, your brand new 3 bedroom, 3 full bath oceanview villa named 'Hale Akala 404' which means 'Home of the Sun' in Hawaiian, has been designed to achieve perfect Feng Shui balance, both in terms of its location (4th floor) and views (unobstructed views of the ocean and the mountains), and well as the top-of-the-line amenities inside the villa. Your luxurious accommodation is just steps from the your very own beach, and from the amenities of our exclusive vacation community and world-class resort - championship golf, a full service spa, swimming pools and ocean lagoons, fine restaurants, a 300 slip private marina for loads of ocean fun. This is your place of joy, for a week, a month, or as long as your heart tells you, you need to get away. Imagine beautiful vistas! Relax in your large, luxurious lanai and savor a tranquil, turquoise panoramic Pacific ocean view framed by picturesque, sandy beach lagoons. -3 full bathrooms, with luxurious tubs, showers, and roomy closet space. -Koi Pond, waterfalls, & lush landscaping. Nearby restaurants (a 5-minute walk) include Roy's and several restaurants at the neighboring ABC marketplace (Monkeypod Café for Pizzas, Two Scoops for Ice Cream, Just Tacos, Hawaiian BBQ, among others, plus the ABC store for quick pre-prepared take-out meals and libations), Chuck's Steakhouse, Kolohe's Bar & Grill , Ushio-Tei Japanese Cuisine, Naupaka Terrace, amongst others (the concierge has an up to date list). Restaurants and activities within 10 miles of the Beach Villas include Hawaiian Waters Adventure Park, Kapolei Theaters, Waikele Premium Outlets, Outback Steakhouse, Chili's, Baskin Robbins, Safeway grocery, Longs drugstore, gas stations, Starbucks, Walmart, Target, and Costco. My wife, our 12-year old daughter and I live in Chicago. So warm weather is always on our minds. Plus we have always had an emotional attachment to the Hawaiian islands and Polynesia -- my wife lived in Honolulu and I lived in New Zealand. As you would expect, our daughter is named after a Hawaiian princess!! We wanted a place which combined big city energy, excitement, amenities, and attractions, with calm, unspoilt, and uncrowded beaches; warm, wonderful folks as neighbors; and all the pleasures of a 7-star resort. That place is the Ko Olina Beach Villas Resort -- a 30-minute drive to Waikiki and a 40-minute drive to Kailua on H3; in a gated exclusive property on Oahu's calm and unspoilt western or Leeward shore. Our villa, aptly named 'Hale Akala 404' which in Hawaiian means 'Home of the Sun', is a luxurious 3 BA/3 BA villa designed on Feng Shui principles: - in the Beach Tower which is the only building directly fronting the beach - on the 4th floor of a 8 floor building, - with unobstructed views of the ocean and the Waianae mountain ranges from a large lanai - tasteful Asian-inspired art, and furniture which allow the ocean breezes to flow through the villa - top-of-the-line bed and bath linens - and a Roy Yamaguchi designed chef's kitchen In addition, we have all the amenities that one would want in a vacation -- lap/lounge pools, jacuzzi, beach bar, top-notch fitness center, assigned underground parking, and the best resort staff you will ever meet -- from Moon Kahele who leads ukelele playing and koi feeding lessons for the keiki (kids), to Summer and her staff that lead you through lei-making sessions, to David and his staff who are there to attend to your every need. We have been to all the Hawaiian islands and each has it own charm. We really saw all of the islands in one place -- at Ko Olina. An outer island experience with all the amenities that discerning travelers have come to expect for their ever so rare vacations. As an old commercial said, 'We liked it so much that we bought the company'!! We invested in our villa because we loved it and everything that came with it -- material and spiritual. As our esteemed guests, we hope you feel the same. Anything that you want to do. If the Beach Villas don't have it, the concierge can arrange it for you, either on the Ko Olina property or indeed anywhere on Oahu or indeed in Hawai'i. Fantastic place. Cannot wait to revisit. The only way and place to stay in Oahu!!! This was the perfect spot, we all loved the Villa, the Beach and the location. Six of us came from ‘the six’ to enjoy the Aloha Lifestyle for a couple of weeks and we spent our first week in Ko’Olina. The photos of the villa are just what you get when you check in at this private complex. You get your own parking spot in the underground parking garage, security keys to get around the building and to the beach. The Beach is the quietest place to be on this side of the island, a beautiful calm, blue Lagoon is waiting for the residents of the Ko’Olina Beach Villas and the few locals that find this paradise. Swimming, snorkeling or sunning is waiting for you. The villa itself is better than a hotel, much more space. Everyone had their own beds - no pull outs needed, and their own bathrooms. We had lots of day trips and tours planned, so we liked the fact that we could have a coffee and breakfast out on our own Lana’i before starting our day. We highly recommend this Villa to Oahu visitors that are looking for a piece of Hawaiian paradise! Also, Many thanks to the owner who personally made our stay worthy of 6 Stars. Mahalo Nui Loa. We arew delighted that you enjoyed your stay and of course for your review. We look forward to welcoming you again very soon. My husband and I brought our 3 boys to Oahu and this condo was just amazing. It is beautifully furnished and has the perfect lanai to eat our meals while watching the ocean or the sunset. There was a huge closet of beach toys, chairs, coolers and even fishing poles that we could use during our stay. The small strip mall of stores and country market were just a short walk down the street. We really enjoyed it all and will definitely be returning. Thank you so much for your wonderful remarks. We are so glad you enjoyed the villa once again. We look forward to hosting you and your family soon again. 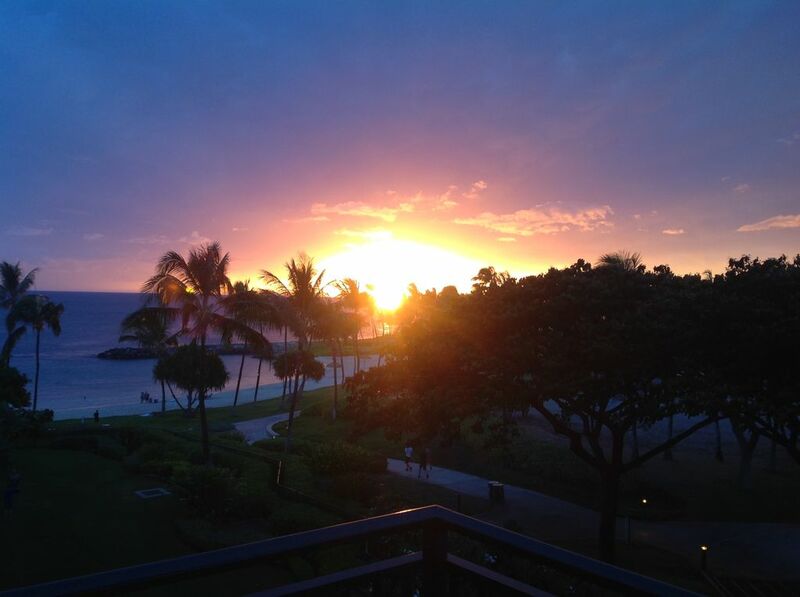 We just got back from a wonderful stay at the Ko'olina Beach Villas. The villa itself was a perfect fit for our extended family. We had a big group and were able to get two different units in the same building which worked out nice. Sandeep and Louie were exceptional in their service. Louie gave us a complete tour of the property and was available for all our needs. The unit came equipped with everything we needed from all the expected kitchen facilities, to beach towels, beach chairs, sand toys, beach mats and so on. We woke up every morning and sat on the lanai, enjoying breakfast with a view. The grounds itself allowed for wonderful morning runs, fun on the beach by the lagoon, and relaxation at the pool and hot tubs. The kids loved all of it. The only downside is that there is no restaurant on site to grab a quick bite while hanging by the pool but the poolside bar (which was awesome) did have little bites like mac and cheese, hot dogs and ice cream that worked out for the kids when needed. We cooked a bunch and make lunches and brought them to the pool area to eat and also grilled one night which was really nice. The location was great to walk to restaurants in the center nearby, walk to the marina for a wonderful catamaran sail and snorkel tour, and the beautiful golf course across the street. We had a lovely stay and look forward to going back in the future. Perfect choice Villa for a wonderful vacation! My family enjoyed staying in the Villa during our recent stay. Everything was as pictured on the VRBO site. The Kitchen look and feel and appliances were a big hit! The overall Villa was nicely designed, well stocked, and very comfortable. Upon checkin, Sandeep ensured that Louie met us to find our parking space in the garage and walk us to the Villa. Once in the Villa, Louie gave an overview of the operational instructions for the appliances, blinds, and lights. We came prepared with lanyards (with plastic card holders) and they were very beneficial since you must use the card to access the garage, gym, beach, and elevators. The lanyards ensured that we did not lose the access card during our stay. Sandeep helped me coordinate a meeting in the Ko Olina Beach Villa’s Owners Lounge. The Owner’s Lounge was a bit windy but overall our 37 guests enjoyed the space to mingle and share a meal together. We liked the more quiet and less crowded Ko Olina area and were glad that it was away from the hustle-bustle of Waikiki. We purchased food from the local Target and cooked most meals during the week. The purpose of our trip was to celebrate a Vow Renewal (25th Anniversary) and graduations from high school and college. We liked the close proximity of Paradise Cove (Luau), Aquaveil Chapel (Vow Renewal), Marina (Catamaran Snorkel Tour), and Roy’s Restaurant (Top of Roy’s - Reception). Everyone appreciated that they could walk to all planned events for the week from the Villa's. All ages would enjoy staying in the Beach Villa’s! If we return to Hawaii in the future, we would definitely stay in this Villa again. Golf: Ted Robinson designed the challenging Ko Olina Golf Course which is on site. The course is a Championship 18-hole course with stunning back drops. A 3-night deposit is required at the time of booking to confirm the reservation. Deposit is fully refundable up to 30 days before the commencement of the stay.